The Canon Digital IXUS 980 IS (also known as the PowerShot SD990 IS Digital ELPH in North America) is the first-ever Digital IXUS / ELPH camera to offer a true manual mode, instantly appealing to all those DSLR owners looking for a pocketable second camera. Other highlights include a 14.7 megapixel sensor, a stabilised, 36-133mm equivalent, 3.7x optical zoom lens, a 2.5-inch, 230,000-dot LCD, a zoom-coupled optical viewfinder, a QuickShot mode, a live histogram, Servo AF, i-Contrast, Face Detection and a Face Self-Timer function. 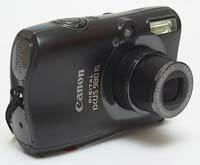 The Canon Digital IXUS 980 IS is available in silver, black and, in some markets, red as well, for a recommended price of �349.99 / $399.99 / �459.99. 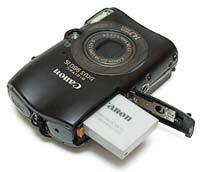 Zoltan Arva-Toth discovers if the range-topping Canon Digital IXUS 980 IS is the best-ever IXUS / ELPH. The Canon Digital IXUS 980 IS / SD990 IS Digital ELPH may boast a number of improvements over its predecessor the 960 IS / SD950 IS � and these will be duly pointed out in this review � but the real headline-grabbing novelty is the inclusion of a full manual mode, providing user control over shutter speed, f-stop, focus and flash output. Older IXUS models had a 'Camera M' setting that Canon sometimes confusingly referred to as a 'manual' mode, but it really was an 'expanded' auto mode. The 980 IS ends this confusion, and it is certainly nice to see an IXUS outfitted with full manual controls. The body is made of metal � although this may not be readily apparent upon taking a casual look at the camera, especially the black version � with only the controls, covers and some design elements being plastic. The Canon Digital IXUS 980 IS has a curvier design than most other cameras in the IXUS lineup, and in this case, this is good news as it succeeds in making the camera more ergonomic than you'd think based on its dimensions alone. And those dimensions are definitely small � you can simply carry the camera in your shirt pocket so that it is always with you, ready to capture anything interesting that crosses your paths. Canon supplies a wrist strap, which you are recommended to attach for peace of mind, even if I never felt like the camera was slipping out of my hands while taking photos. One thing that hasn't changed from the 960 IS is the stabilised, 36-133mm equivalent, 3.7x zoom lens that sits fully retracted into the body when the camera is switched off, but extends very rapidly upon power up. The maximum aperture is a fast f/2.8 at the wide end but a slow f/5.8 at the other extreme of the zoom range. In Manual mode � which of course was missing from the 960 IS � you have a choice of using the lens at full aperture or dialing in an f-stop that's approximately 3 stops slower. You don't get anything in between the two values, and the reason, I believe, is that there is probably no iris diaphragm built into the lens. So whenever choosing the 'smaller aperture', what you do is simply engage a built-in neutral density filter. To test my theory, I took two shots at the telephoto end, one at the maximum aperture of f/5.8, and another one at the other selectable f-stop of f/16. The depth of field in the two photographs turned out to be identical, suggesting that stopping down did not affect the physical size of the aperture. Using an internal ND filter instead of a diaphragm actually makes some sense in a camera that has a small sensor � diffraction would eat away at details if you used 'real' f/16 anyway. The downside is that it limits manual control over exposure � fortunately, you still have two other variables (shutter speed and sensitivity) to play with. Above the lens, and slightly to the left if viewed from the front, is the IXUS 980 IS' optical viewfinder (OVF), which is coupled to the zoom, meaning that its angle of view changes along with that of the lens when you zoom in or out. This viewfinder is tiny and suffers from an obvious parallax error, but can come in handy when you aim to conserve power, get additional stabilisation by pushing the camera against your forehead, follow the subject while shooting in burst mode, or when using the camera in Quick Shot mode (more on that in a minute). Three other notable elements on the front plate of the camera are a small microphone, an AF assist lamp and the built-in flash. Canon do not quote the guide number but say the flash provides illumination for up to 4.6m at wide angle and 2.4m at telephoto, without specifying the sensitivity setting at which these numbers hold true. At any rate, I've found this flash to be noticeably more powerful than the slimline unit built into the IXUS 870 IS. The top of the Canon Digital IXUS 980 IS features just a couple of controls � a power button and a shutter release surrounded by the zoom lever. Gone is the separate LED that sat beside the on/off button of the 960 IS � now, it is the button itself that lights up when the camera is powered on. The other changes to the top plate are even more cosmetic in nature, restricted to the addition of a curvy strip of plastic and a redesign of the speakers. At first sight, the back of the camera also looks unchanged, but a closer look reveals a few novelties, some of which are related to serious functional improvements. What hasn't changed is the 2.5-inch LCD that is ideally sized for the 230,000-dot resolution it offers, the optical viewfinder which we already described, and the overall layout of the controls. It is the controls themselves that offer some extra functionality, starting with the mode dial. On the IXUS 960 IS, it had four positions � one for the Auto mode, another one labeled with that deceptive �Camera M' icon, a third one for the Scene modes, and a fourth for movie capture. The mode dial of the 980 IS has five positions, out of which Auto, Scene and Movie offer essentially the same functionality as before. 'Camera M', however, has given way to the more conventional and unambiguous Program and Manual modes. To toggle between these two, turn the clever little control wheel that encircles the four-way pad below the mode dial. In Program mode, you get full access to the camera's ISO settings as well as the exposure compensation function, but have no direct control over aperture or shutter speed. This is reserved for the Manual mode. To set these exposure variables, you first need to press the FUNC/SET button sitting in the middle of the four-way pad. After that, you can set the shutter speed by way of the control wheel, and the f-stop with the Right and Left navigation buttons (within the limitations discussed above). Dyed-in-the-wool photography traditionalists may grumble that such basic functions should be easier to access � and I admit that this slightly awkward implementation caused me to use the Manual mode less often than I originally thought � but most will agree that it is still a good compromise. To aid you with obtaining the perfect exposure, Canon have also added an optional live histogram overlay, which is something I think should be standard on all compacts (and all Live View-capable DSLRs too, for that matter). New to the IXUS 980 IS is a shooting mode called Quick Shot. In this mode, the LCD turns into a status display not unlike that of am entry-level DSLR. Control over most shooting variables is retained, although manual setting of the shutter speed and the f-stop is not possible. Framing is done by way of the optical viewfinder, while Servo AF continuously and automatically adjusts the focus, without your having to hold the shutter release depressed halfway. Whenever you think the right moment arrives, you press the shutter button fully, and a shot is taken, with much less delay than you are normally accustomed to seeing from a compact digital camera. When I first learned about this mode, I was skeptical, but in practice it turned out to work better than I had expected � at least when there was a lot of light and I didn't want to use the flash. Please note that in this mode, you are not saving power by using the OVF because the LCD is still on, and the auto-focus motor is continuously working too. Virtually all of Canon's compact digicams (including some that cost about a third of what you have to pay for the IXUS 980 / SD990 IS) offer a few little known but advanced functions � and of course the flagship Digital IXUS / ELPH is no exception. These well-kept secrets, which you usually only learn about if you read the user guide attentively, include auto-focus lock (AFL), autoexposure lock (AEL) and flash exposure lock (FEL).� To lock the focus on a subject for a series of consecutive shots, press the Left button on the four-way pad once while holding the shutter release depressed halfway. To lock the ambient exposure, do the same with the Up button. Flash exposure lock is achieved the same way when the flash is set to Forced On. AEL is available in Program, Quick Shot and Movie modes (you needn't hold down the shutter release for AEL when you are in Movie mode though). AFL is also available in Manual mode. The Canon Digital IXUS 980 IS goes even further, by adding manual focus (MF) and direct regulation of the flash's output to the features list. MF is selectable after pressing the Left button (with the other options being Normal, Infinity and Macro AF). The centre of the frame gets magnified to aid you with focusing, and a distance scale is displayed. Thoughtfully, Canon have provided a way to change the distance units from the menu. Manual focus � which can be useful whenever auto-focus doesn't work � is available in Program, Manual, Movie and most Scene modes, but not in Quick Shot mode. The other extra function, direct control over the flash burst's intensity, is only provided in Manual mode, where it can be set to one of three levels. So in summary, what sets the IXUS 980 IS / SD990 IS apart from the rest of the cameras in the Digital IXUS / ELPH range are a manual exposure mode, a live histogram, a Quick Shot mode, a manual focus option and the ability to directly control the output of its flash. In other respects, it works very much like any other Canon compact, with a well-thought-out Function Menu providing access to a number of settings, including exposure compensation, white balance, My Colours (with the options being Off, Vivid, Neutral, Sepia, Black-and-White, Positive Film, Light Skin, Dark Skin, Vivid Blue, Vivid Green, Vivid Red and Custom), metering mode (evaluative, centre-weighted and spot), file quality level (superfine, fine and normal) and resolution. Note that some of these options may be unavailable depending on which shooting mode you are in. As usual, one of these functions � and a few more that are buried in the long-winded Shooting menu � can be registered to the Direct Print / Share button sitting left of the Playback button. My choice would be either one-touch white balance or direct movie recording, the latter of which turns this button into a 'movie shutter release', no matter what shooting mode you are in. The other camera menus are available at a press of the Menu button located in the bottom right corner of the camera's back. In the Shooting menu, you may do things like specifying the AF Frame (AiAF, Centre or Face Detect, the latter of which can now recognise faces at sharper angles), enabling or disabling Servo AF (useful for tracking subjects in motion), adjusting various flash settings, turning the live histogram on and off and setting the new i-Contrast function (which is Canon's answer to Sony's DRO, Nikon's D-lighting and Olympus' SAT, and works by lifting the shadows while leaving the midtones and the highlights alone in a high-contrast scene). There's also setting the IS mode (which can be Continuous, Shoot Only, Panning or Off), displaying grid lines and/or a 3:2 aspect ratio mask, switching the AF assist light and the magnified display in MF mode on or off, the afore-mentioned mapping of one of a dozen functions unto the Direct Print/Share button, and setting your drive mode preferences, including the new Face Self Timer function. Basically what this means is that you press the shutter release, walk into the scene, and two seconds after the camera detects that a new face appeared in the frame, it will take a few shots � and it is the number of shots that you can change by way of this menu item. The Face Self-timer can come in handy when taking a self-portrait or a group shot with you being part of the group. The Setting menu is for settings that you make once, typically when configuring the Canon Digital IXUS 980 IS to your tastes, never to change them again. These include things like muting all electronic beeps, setting the LCD brightness, the time zone, the menu language, the video system (NTSC or PAL) etc. Card formatting is also buried in this menu, rather inexplicably. Finally, there is a third tab labeled My Camera Menu, letting you to customise your camera further by choosing the start-up image and a number of camera sounds. In Playback mode, there are two extra tabs. The Playback Menu has an above-average range of options, including, beyond the standard Slide Show, Erase, Protect and Rotate items, features like post-capture i-Contrast, red-eye reduction, trimming, resizing and voice memo recording. Voice memos are recorded by way of the microphone located on the front plate, and can be useful if you want to add comments to your photos in the field. Finally, there is a menu tab called the Print Menu, with options for those who want to send their photos directly from the camera to a separately sold PictBridge compliant printer. There is only one port on the right side of the Canon Digital IXUS 980 IS (when viewed from the back), which accepts both the USB interface cable required to connect the IXUS 980 to a printer or computer, and the AV cable. The memory card and the battery share a common compartment with a lockable door on the bottom plate. 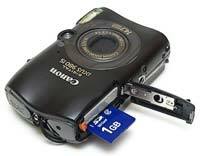 The IXUS 980 takes SD/SDHC cards and is powered by a proprietary Lithium-ion battery. Both the card and the battery are prevented from accidentally falling out, even when the cover is open. Changing cards or batteries is not possible while the camera is mounted on a tripod, because the compartment door hinge is too close to the tripod socket. As expected from an IXUS / ELPH, the latter is made of metal, so feel free to use the camera on a tripod regularly. PhotographyBLOG is a member of the DIWA organisation. Our test results for the Canon Digital IXUS 980 IS have been submitted to DIWA for comparison with test results for different samples of the same camera model supplied by other DIWA member sites.